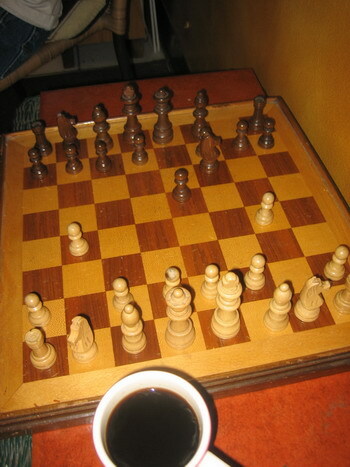 A coffee in the middle of the afternoon over a game of chess in a café tucked away in a remote corner of Glendale. Real cups, comfortable chairs. Other people at other tables engaged in quiet conversation. No noise. No laptops. Hold it there. No laptops. A couple of years ago I was all for hot spots everywhere. Yes, Wi-Fi the city, all cities, make the internet accessible everywhere for everybody all the time. My outlook has changed. I do not want to have people hogging all the seats in all the coffee places with their laptops. I can understand taking the laptop to a library to do some work on some research. Business travelers at an airport – yes, by all means, use those empty hours while waiting for the flight to do some work. But a café is different, at least in my opinion. I go there to have some coffee and relax. Have a quiet chat. Read the papers. Play chess. Fill up on the latest delicious gossip from the latest party. Nowadays however it is hard to find a place which does not look like an office with people tapping away on their computers. So my excitement from a few years ago has changed to the opinion that Wi-Fi everywhere is not a good move. Incidentally, this opening wasn’t either. White lost. Ouch.